Rudyard Kipling's famous tale tells the story of Mowgli, the 'man-cub' rescued from the tiger, Shere Khan, and adopted by a wolf pack. As he grows up, Mowgli learns the ways of the jungle from Baloo the bear, Bagheera the black panther and Kaa the rock python. His life is full of adventure with the jungle creatures, but soon the time comes when he is forced to leave and take his place among his own people. A kind woman looks after Mowgli but she can't protect him from the superstitious villagers who believe his friendship with wolves is the result of sorcery. Mowgli's only escape is to return to the jungle. But even the jungle has become a dangerous place. 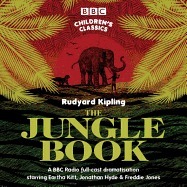 This rich and entertaining dramatisation skilfully blends words with jungle sounds and music, and stars Eartha Kitt as Kaa, Freddie Jones as Baloo, Jonathan Hyde as Bagheera and Nisha Nayar as Mowgli.